"The Peacekeeper Wars: Part 2" / "The Peacekeeper Wars: Part 1"
"The Peacekeeper Wars: Part 2"
"The Peacekeeper Wars: Part 1"
None of it is quite right. Pilot’s voice is all wrong, as the audio settings needed to properly process Lani Tupu’s voice were lost in the 18 months between “Bad Timing” and this miniseries. Melissa Jaffer had such a serious reaction to her makeup that Noranti had to be hastily written out of the miniseries, her brief appearances after the initial section of the story performed by a stand-in. Chiana’s new eyes, a hasty resolution to her permanent blindness at the end of season four, fundamentally alter how the character comes across. Jool’s appearance, such as it is, carries over little sense of her past characterization, in favor of a warrior huntress with a Crichton infatuation. The first time I watched this, I honestly didn’t realize Scorpius’ companion was Sikozu until about halfway through the story. I wish I could say these issues are merely cosmetic, but they are jarring enough to affect key scenes—one of the most heartbreaking moments in Farscape history is nearly ruined when Pilot asks if a character is dead, because Pilot just doesn’t sound like Pilot anymore. Let’s get the parts that don’t work out of the way. If “The Peacekeeper Wars” really is the skeletal structure for an entire season, then it’s chilling to imagine just how many episodes would have been devoted to the Eidelons. Would we have spent multiple episodes with Moya traveling to Arnessk with Pikal, the would-be peacemaker who is in the running for wettest, blandest character in Farscape history? 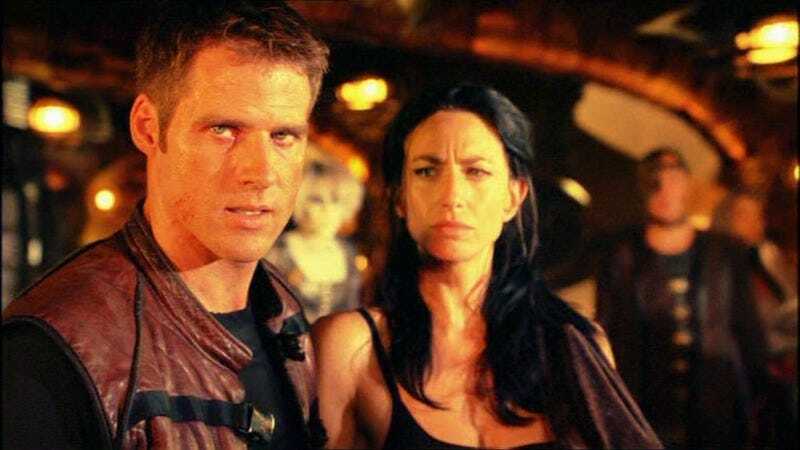 The Eidelons bookended season four, after all, with the ancients appearing at the end of “What Was Lost” and a descendant crystallizing John and Aeryn in “Bad Timing,” so it’s safe to think they would have been major players. Yet this is the one element that works far better in condensed form, as the Eidelons are mostly interesting only as a feint, as a way for John to put off accepting the inevitable about wormhole weapons. While Heirarch Yondalao’s efforts to reach Emperor Staleek is moderately interesting for how it examines Scarran psychology, most of the Eidelon business is just a lot of platitudinous bromides about the importance of peace. I have no issue with a fiercely anti-war stance—quite the opposite, in fact—but this material is closer to the superficial politics of “A Prefect Murder” than the more compelling intrigues among the Scarrans and the Peacekeepers. There are two kinds of characters who are well-served in this story. There are those the miniseries commits to as its featured players: John, D’Argo, and Scorpius, and maybe Aeryn and Chiana. Then there are those like Rygel, who don’t need their own arc to function in the larger story and so can pop in with one-liners, heartfelt pleas, or whatever else is required. It’s those in the middle who are screwed. Jool is the most blatant, with what would likely have been a two-parter built around the return to Arnessk reduced to five minutes and all of 13 lines before her unceremonious death. Sikozu’s betrayal of Scorpius to the Scarrans is told in such shorthand that it comes dangerously close to undoing her entire character. Yes, “We’re So Screwed” established that the liberation of the Kalish was of foremost importance to her, but the idea she would trust the Scarrans—War Minister Ahkna, no less!—defies understanding without seeing how she came to change her views. Stark isn’t quite so compromised by the iceberg approach to storytelling—you only, you only see 10 percent of what’s going on—but his protracted absence even before the 18-month hiatus means it’s harder for the audience to connect with him or to place him in the context of this latest version of Moya. His inner peace is hard-won, but it doesn’t mean as much as it could. I wonder whether Farscape would have killed D’Argo if it had gotten a season five. A full-scale war does perhaps demand greater sacrifice to demonstrate the stakes, but the only truly comparable character death came because Virginia Hey could no longer wear the Zhaan makeup. In terms of what does actually happen, D’Argo tempts fate early when he starts making plans to move to Hyneria with Chiana. The story takes some pains to wrap up his story, confirming his and Chiana’s love is well and truly rekindled and giving him a chance to reconcile with his son Jothee. The former is more compelling than the latter—Jothee is better here than in previous appearances, but he’s a character who would have needed more time than he gets here to seem interesting next to his father—but the plot beats really aren’t the point here. D’Argo’s story works because of what’s come before, because Anthony Simcoe and his costars are able to imbue every scene with the relationships they have developed over the previous four seasons: His love of Chiana, his friendship with Crichton, his comradeship with Aeryn. His death is emblematic of much of “The Peacekeeper Wars,” really: The miniseries itself is too compressed and rushed to earn something of such magnitude, yet it’s so clearly just an extension of the original show that the moment still has power. It’s not surprising that it’s the Crichton-centric material where “The Peacekeeper Wars” is most successful. Not so much the business with his and Aeryn’s baby, admittedly, as there’s some undercooked material about Aeryn not necessarily wanting to be a mother that the miniseries can only devote a handful of lines to. A pregnancy plotline in general can be tricky business for a show so focused on a female character’s personal growth, and the story largely papers over any difficult questions around whether is Aeryn giving up her some of her hard-earned individuality by becoming a wife or mother by just having her be a total badass as often as possible. The great flaw of season four—one I didn’t really get into, but one longtime and reliably insightful commenter did—is how it defines Aeryn so entirely in terms of John, and that carries over to “The Peacekeeper Wars.” While this story does provide a sweet, poignant moment for the saga to end on, with D’Argo Sun-Crichton taking his first look at his playground of stars, it mostly matters in terms of how it pushes John to unleash the wormhole weapon. And that’s the real achievement of this story. Everything to do with that weapon—how Pilot and Moya listen to Aeryn and come through for Crichton one last time, how Einstein grants the knowledge and immediately snatches it away, how Scorpius gladly begs to see it and is then sent away—is handled perfectly. It almost makes all the tedious Eidelon blathering about peace worth it for John’s observation that no weapon can make peace, that the only peace a weapon like this can provide is that of a galactic grave. Even Scorpius finally recognizes the insanity of such weapons, while Stark and Chiana look to prayer and Rygel continues being the low-key best part of this story by declaring such a black hole a death worthy of a dominar. Farscape succeeds in part because it always knew how to escalate the threat. Crais gave way to Scorpius, who gave way to the Scarrans (and Grayza, I suppose, if we’re feeling very generous). Now wormholes, which began as merely the mechanism that sent John to the other side of the galaxy, manage to make the entire Peacekeeper armada and the entire Scarran empire look insignificant. This is the terrible knowledge that has tortured John and for which he has been tortured. In an instant, John renders all the politics, all the fighting, all the frelling dren meaningless, so all that’s left are those around you. “The Peacekeeper Wars” never forgets that it’s Farscape and why that makes it special, but it’s fair to say it rushes through a few too many necessary reminders. But the wormhole weapon brings everything to its logical conclusion, drawing together themes, plot points, and character beats that go all the way back to the first episode. It’s a worthy ending to the adventure, and one that justifies the narrative sacrifices the miniseries must make to reach that point. We do get resolution on the Sebaceans’ heritage, with it all but confirmed the Eidelons uplifted ancient humans to serve as Peacekeepers.It’s a nice, straightforwardkind of explanation, even if it’s mostly just ticking off another item on the mythology list at this point. I mentioned this in passing in the comments yesterday, but it’s intriguing to think about whether the show would have tried bringing another enemy aboard Moya like with Crais and Scorpius. Grayza would be the obvious choice for a season five, though a bit underwhelming after Scorpius. More interesting is the possibility of an exiled Emperor Staleek or War Minister Akhna forced to join Moya. Rygel does get a little progression in his own story with his usurper Bishan’s invitation to return to Hyneria. It’s hard to know how the show could ever have realistically hoped to depict the resolution of such a story on-screen without building dozens of puppets, but I would have enjoyed seeing the show try. It’s a shame Grayza didn’t officially declare herself Grand Chancellor after killing Maryk, thus completing her Servalan tribute act. Now I’m search of a new space opera, I’m tempted to give the ultra-low-budget charms of Blake’s 7 another go. It’s fun to watch this miniseries with an eye toward figuring out what quick bits of business could have expanded to entire episodes. Moya underwater would have been a hell of a tense (and likely prohibitively expensive) hour of television. And now, as we near the end, let’s take a moment to consider Farscape as a whole. I’ll admit I’m at something of a disadvantage, as I’m long overdue for a rewatch of the show’s first three seasons. So I’ll spare you any grand attempt to make a definitive statement on the series. Besides, you can find plenty of those scattered through the past 89 reviews. 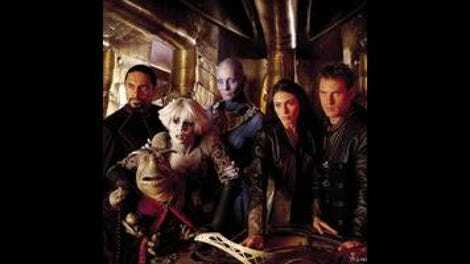 Instead, I just want to reflect on why Farscape means so much to me. Like any science fiction show, especially any that can find a home in the nebulously defined space opera sub-genre, a lot of Farscape’s appeal lies in its grand adventure, in its exploration of the wild unknown beyond our world. Yet right from the beginning, we learned the universe was a far more complicated and dangerous place that John could have ever imagined. The very first thing Crichton did after coming through the wormhole was inadvertently cause the death of Crais’ brother, and that set the tone for all that would come after. No one perfect the art of being in the wrong place at the wrong time quite like John Crichton, yet he proved again and again he was the right person to be there. Life is fragile on Farscape, and even the most hardened survivors can find themselves broken. If there’s one thing that sets this show apart from its compatriots, it’s that commitment to showing the consequences of the characters’ actions. This is a show about trauma. Harvey wasn’t just a nifty plot device to give Wayne Pygram more of a presence on the series. He was also a literal manifestation of how abusers can live on in the minds of those they have hurt. In the three years between writing about season three and wrapping up coverage this weekend, I have come to know and care about people who have survived abuse and grappled with PTSD. I wouldn’t claim I somehow can understand their experiences because I’ve watched Farscape, but its story feels even more visceral and human and important than it did when I watched the show for the first time nearly six years ago. Beyond that, Farscape is about friendship, or perhaps about family—at a certain point, the two become indistinguishable. It’s about how individuals can become something more, as John promised Aeryn back in “Premiere,” and how those two notions can converge. Everybody on Moya became a better person over the course of the series, and so much of that has to do with the people they found themselves traveling with. As unfortunate as Virginia Hey’s premature exit was, perhaps it was fitting that Zhaan died, as she always had the least traveling to do. The Aeryn, D’Argo, Rygel, and Chiana of the fourth season and “The Peacekeeper Wars” are unrecognizable from those we first met, and Farscape was generally careful not to suggest Crichton was the magical human presence that made them all better. The community they forged together is what allowed them all to grow and mature, even as the universe lashed out at them again and again and again. Perhaps that’s why Farscape strikes me as so fundamentally optimistic. A show’s optimism shouldn’t be judged by the world it creates. Even the most cynical series can buy a cheap resolution by having everything work out just right when the heroes need it to. Farscape certainly never did that, nor did it much bother with big, bombastic speeches about our highest ideals. (Not that I mind that sort of thing—I mean, go read any of my Doctor Who reviews.) Optimism isn’t determined by what happens around you nor by what you say you’re going to do, but rather how you get on with and face whatever fresh hezmana awaits you. As “Twice Shy” underlined when Moya’s latest invader removed it from him, Crichton is defined by his refusal to give up. He recognizes what must be done and then is prepared to do whatever he has to—not generally to win, but simply to survive and to protect those he cares about. If that means blowing up a command-carrier or striding into a Scarran-Peacekeeper peace summit with a nuclear bomb strapped to him, then so be it. That willingness to look the universe and its horrors square in the eye, that belief that it’s worth it to keep fighting even when you’re already broken, even every plan fails, because you have the right people at your side… there’s an optimism in that. There’s hope in that. It's a defiant, ornery kind of hope, but then that's the best kind. Look again at “Bad Timing”: Farscape didn’t pretend Earth would welcome alien visitors with anything but skepticism and fear, yet it still allowed that moment where Jack told his son that humanity was slowly coming together. That might seem like a distant dream, one that feels about as distant now as it has ever been, but Farscape taught us again and again that the impossible battles are the only ones truly worth fighting. With that and everything else across its four seasons and change, the show accomplished what John kept inviting us to do, of getting us to look upward and share the wonders he has seen. Goodbye, everyone. It’s been so much fun.